Philadelphia attorney Tim Bak became very familiar with Suffolk when he was helping California-based Friant and Associates search for an East Coast location. Founded in 1990 and based in Oakland, Friant and Associates designs and manufactures customizable office systems. The company started its search for an East Coast location in 2013. Being on the East Coast was important to the company. “It’s hard to be on the West Coast and support our East Coast dealers and customers,” says Paul Friant, the company’s president and CEO. After looking at all of the variables, the company narrowed its search to Virginia and Maryland. It toured existing space in Baltimore. “That looked good, the pricing was right, and there were incentives from Maryland,” Bak says. 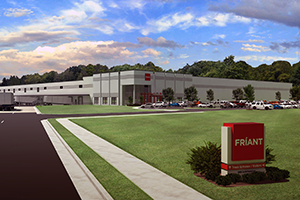 The site selected in the CenterPoint Intermodal Center in Suffolk, however, will be a new 357,000-square-foot facility, and that factor appealed to Friant. The building is owned by the developer, Chicago-based CenterPoint Properties. Friant is the long term leaseholder. The company hopes to be open by early summer. Suffolk’s central location on the East Coast and its proximity to the Port of Virginia also were pluses. Friant imports furniture components as well as some finished pieces from China. “But most of its manufacturing is done in the U.S.,” Bak says, noting the company’s 300,000-plus-square-foot manufacturing facility in California. The Suffolk location also is expected to benefit from the impending expansion of the Panama Canal, which will double the canal’s capacity. Companies like Friant will be able to ship products on larger ships. “They will be able to get more product to the East Coast with a shorter route through the Canal,” says Kevin Hughes, Suffolk’s director of economic development. Timeliness is crucial to the company’s reputation for customer service. Friant prides itself in its quick turnaround on orders. The company offers customers two shipping schedules: one option is five days and the other is 10 days. The company liked the fact that the outside space in CenterPoint was large enough to allow drivers to pick up a container from the port, park it at the facility and then pick up and transport another container. “It’s more efficient to leave it and get what goes out,” Bak says. The VEDP and the city teamed with the Port of Virginia and the Hampton Roads Economic Development Alliance to secure the project. Gov. Terry McAuliffe approved a $200,000 grant from the Governor’s Opportunity Fund, and the company will receive benefits from the Port of Virginia Economic and Infrastructure Development Zone Grant Program. Additional funding and services to support the company’s employee training activities will be provided through the Virginia Jobs Investment Program. The company’s $17.4 million investment will create 166 jobs over three years. “We will start with at least 75 employees and move up to 166,” Bak says. The new jobs in advanced furniture manufacturing are expected to help diversify Suffolk’s industrial base. “We’re excited about that,” Hughes says. Bak is complimentary of the way negotiations were handled by the city and the commonwealth. “They were very professional and knowledgeable,” he says.